... collection is blown and features either lead or brass came. With the ‘Canal Grande’ collection, it’s possible to create bespoke kitchens, living room furniture, bookcases and wooden panelling. The ridges in this sink mimic the sloped curves on a terrain. The water flows gently downward, to eventually disappear down the drain. L 170 x W 70 cm. Square or round, the built-in bowls with radius 60 can be equipped with chopping-boards, baskets, plate racks, smooth or perforated basins, that extend their function. Counter top kitchen sink 75. Thick stainless steel sink, brushed and welded into the countertop. Equipped with overflow for water drainage, brass faucet/mixer tap. 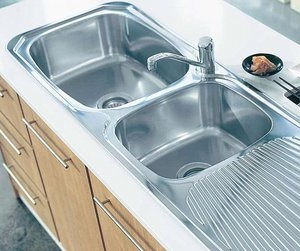 High thickness stainless steel (1/16″) built-in sink. Brass frame. Cut-out size dimensions: width 15 15/16″, depth 15 15/16″, height 7 1/16″. Standard details: hammered frame. Other dimensions and trims on request. High thickness burnished brass (1/16″) built-in sink. Brass frame. Cut-out size dimensions: width 15 15/16″, depth 15 15/16″, height 7 1/16″. Standard details: hammered frame. Other dimensions and trims on request. ... part, a stainless steel is the most popular choice because of cost and serviceability. The lower the gauge the thicker the sink wall will be. Extruded aluminium structure with an off-centre base that allows it to jut out considerably. ArchiExpo offers kitchen sinks by shape (round, rectangular, etc.) and by material (stainless steel, ceramic, composite, copper, wood, etc.). Such sinks are generally used for washing dishes in home and professional settings. These sinks can be oblong, round, rectangular or other shapes. They are made of a wide variety of materials, including vitreous porcelain, ceramic, enameled stoneware, stone, concrete, stainless steel, copper, brass, zinc, wood, Corian® and synthetics. Choice of sink will depend on available space, ergonomic and functional needs, and individual taste.